A British soldier is separated from his unit during a riot in Belfast in 1971. Jack O’Connell plays Gary Hook , the soldier in question, and his survival instincts and training kick in once he is on his own. Set on the front lines between an area that separates the Catholics and the Protestants, this is realized with accuracy and great design. O’Connell continues to be one of my favorite actors du jour and delivers another brilliant, visceral performance to add to his canon. He was superb in Starred Up, I haven’t seen Unbroken yet but I would put money on another great piece of acting from him. Support comes from the ever interesting Sean Harris as an undercover soldier Captain Sandy Browning, manoeuvring his way through a very volatile, dangerous situation. Paul Anderson is Sergeant Leslie Lewis, one of Browning’s team. Richard Dormer is Eamon. Australian Sam Reid plays the posh Lt Armitage. Killian Scott is Quinn and Sam Hazeldine is the C.O. David Wilmot plays Boyle, one of the locals and Babou Ceesay is Hook’s Corporal. Everyone is on point, committing 100% to bring the best work they can to this exciting rollercoaster ride. It takes about 20 minutes for the action to kick in and is very exciting. The tension is ratcheted up and once the ride begins it doesn’t let up. There are moments of sparse or no dialogue and they are utilized brilliantly, allowing the audience to feel what it must be like to be in such danger. The script is written with skill and economy by Gregory Burke. There are elements of Escape From New York, The Purge and even Homer’s Odyssey here and it works very well. One of the film’s strengths is the fact that it doesn’t take sides, merely showing you both sides neither leaning to one side or the other. No-one is 100% bad or good, as in life there are contradictions and this elevates it from the usual war fare. Everyone has their reasons whether reasonable or not. It was a time of unrest, a real war where everybody is affected one way or another. Politics is left out as is an anti or pro stance. War is ugly and makes people do all sorts of messed up things. The rules become different. 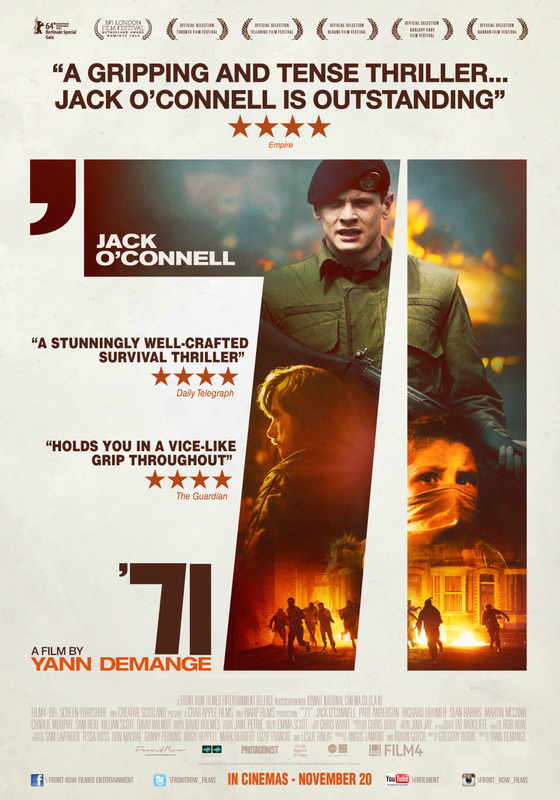 Directed with skill and considered pacing by Yann Demange who is making his debut as director, he previously directed the fantastic Dead Set and Top Boy for Channel 4. He is one to look out for. Special mention must go to David Holmes for creating a soundtrack that perfectly complements the images and helps raise the tension at all the right parts. A brilliant thriller that stands on its own two feet and arrives with confidence and assurance.